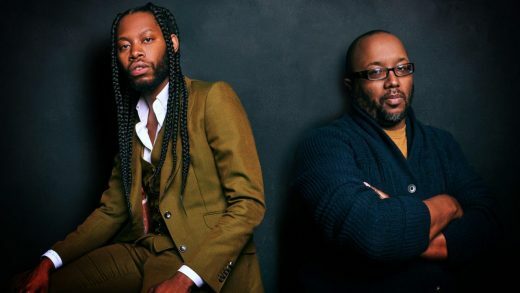 In a recent interview with Out magazine, playwright Jeremy O. Harris says he explains Slave Play, his new play at New York Theater Workshop, to prospective audiences as such: “It’s a slave play; there’s a history of them; go see mine.” If that sounds vague, it’s meant to be; he notes that audiences will experience the play best when they go in knowing as little as possible. What you can know is that Harris has been gaining traction and acclaim over the past few years for his work, which presents a refreshingly and unapologetically queer, black addition to the theatrical canon, which has a long history of being (and remaining) quite the opposite of that. You may have noticed we’re skipping Thursday this week in the listing, but fret not, come Friday you can jump right back into your show-seeing. Why not help your turkey (or tofurkey) digest with some laughter? Emma Rogers and Jesse Roth are presenting a new hour of comedy that’s themed around everyone’s favorite festival involving jousting and centuries-old garb: a Renaissance Faire. 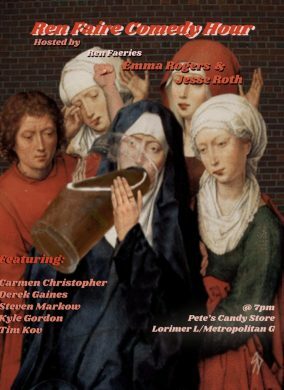 So come all ye hither and thither for jokes (and maybe jousting, but that back room is pretty small) by Carmen Christopher, Derek Gaines, Steven Markow, Tim Kov, and Kyle Gordon. Though by Saturday it’s over, we should still remember Thanksgiving was founded on violence and genocide, and we should always be doing what we can to fight back against the ways this toxic foundation still pervades our country today. 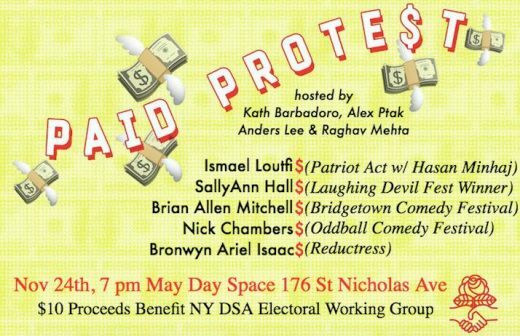 I can’t say attending a socialist comedy show in Bushwick that raises money for DSA’s Electoral Working Group (which helps elect leftist and socialist candidates on the local level) is the largest and noblest thing you could to do help, but it’s certainly something worth doing, and something you can do on Saturday night. Expect the talents of Ismael Loutfi, Bronwyn Ariel Isaac, Nick Chambers, Sally Ann Hall, Brian Allen Mitchell, and hosts Kath Barbadoro, Alex Ptak, Anders Lee, and Raghav Mehta. If you’re not familiar with the work of Reverend Billy and his Stop Shopping Choir, know that while their name sounds religious, they’re different than any church you or I grew up in. The church I went to did have a rock band, but it was that kind of bland Christian rock band fronted by a white dude with a goatee and acoustic guitar. This is decidedly not that. Rather than generic platitudes, expect musical musings on radical activism, saving the rapidly-decaying environment, and fighting back against borders, detainment, and anti-immigrant sentiment. That last one is particularly personal for the group, as many of their choir members (including New Sanctuary Coalition activist Ravi Ragbir) have faced deportation or threats of it in the past year. If you miss the choir this time around, they’ll be hitting the Pub weekly through December 23. « One of Greenpoint’s Most Iconic Bars Comes Back to Life This Month	» Verizon Is, Like, So Over Cell Phone Stores and All About Immersive Pop-Up Experiences Now, You Know?